Citizen Kane is a masterpiece in the literal sense of the word. 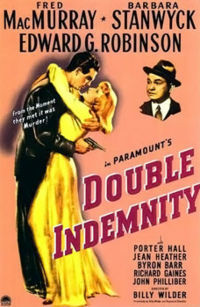 Initially ignored by the masses during its formative years (even though it scored rave reviews and 9 Oscar nominations), the film finally received its well deserved recognition during the 1950’s onwards during, which time it was frequently perched at the top of various greatest films of time lists. 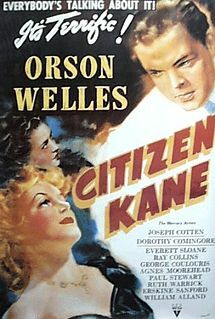 Citizen Kane chronicles the rise and fall of newspaper tycoon Charles Foster Kane (Orson Welles). The film begins at Kane’s fog infested estate Xanadu, which is inhabited by a gargantuan palace filled with a vast amount of statues and art, while outside numerous animals reside in its jungle surroundings. Kane – now an old man – is slumped over his bed and moans his last word “Rosebud” before passing away. This is followed by a dazzling rundown of Kane’s life in the form of a newsreel. 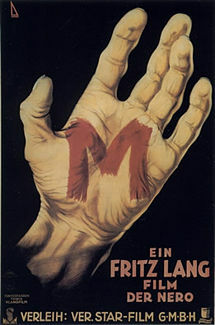 In it the viewer finds that Kane – a self described man of the people – was equally loved and loathed in his life, with some going as far as labelling him a fascist and communist, which is ironic since Welles himself was also accused of being a communist by real life media tycoon William Randolph Hearst, who did not take kind to being the prime inspiration for Kane. Continuing with its nonlinear format, the film traves back and forth in time as a reporter (played by William Alland) chronicles Kane’s life whilst trying to solve the mystery of his last words. To state that Citizen Kane has had a significant cultural and cinematic impact would be quite the understatement. On top of the fact that the film has influenced numerous filmmakers as varied as Tim Burton, Francis Ford Coppola, and Peter Bogdanovich (amongst others), Citizen Kane was a film ahead of its time, a revolutionary film –if you will - which changed the look and feel of cinema due its various innovative film techniques and style. The films success is entirely due to the genius of Orson Welles, who at the age of 26 – on his feature debut no less – changed the scope of cinema forever. His camera moves freely with a steady and graceful flow, capturing all of the wondrous visuals before him whilst also staging some truly unique and haunting scenes, such as when Welles walks across a full wall size mirror only for his image to be reflected seven fold in numerous parallel mirrors. The cinematographer on Citizen Kane, Gregg Toland, created some truly original imagery due to the use of the then groundbreaking deep focus technique, which brought forth foreground and background images into sharp detail. Toland also captures light and shadow and uses both to startling effect, with in some cases characters are either immersed in blinding light or dwelling in pitch black shadow. 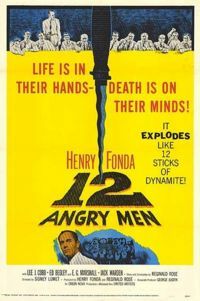 Keeping it all together was then editor and future Oscar winning director Robert Wise, who achieved something of a feat by taking on months and months of film stock and slicing it together to create a well paced and intriguing watch. The infamous Bernard Hermann also contributes with a great score. One thing that is not mentioned enough is the films natural performances, which is something of an anomaly during the 1930s-1950s ham acting period of American cinema. Welles proves to be quite the alluring presence on screen, who commands a deep, hypnotic voice which transfixes those that listen. Supporting roles are filled quite nicely, with special mention to Dorothy Comingore who played Kane’s second wife, Susan. Aiding the films actors are some startling make-up effects, which exceptionally ages their characters during the films 50+ year period. Citizen Kane is not only an entertaining film, but it is also a deeply heartfelt, though provoking, and intelligent one as well. Like a fine wine it has aged well over the last 60 odd years, and it is also a re-watch able film which always contains a new surprise with every repeated viewing.